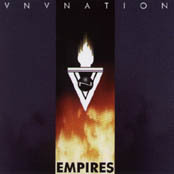 Having been around for almost ten years, and temporarily based in Toronto, VNV Nation ( Ronan Harris and Mark Jackson ) had their debut-CD "Advance and follow" released in 1995, with their second full-length offering "Praise the fallen" following in 1998. So finally, on December 17th, a crowd of 150 squeezed into the sold out Upstairs at the Garage for the official "Empires" launch-party. The doors opened about 45 minutes late, as the in-house mixing desk decided to pack-in during the sound-check. However, everything was up and running by the time we got in and the DJs started playing some excellent records you don't get to hear very often. VNV Nation took over at 10.30pm and after a short intro opened with JOY, KINGDOM and RUBICON ( question: Why is it always the girls that scream when they play this song? ) followed in their usual high-energy style. Awesome. The show ended with Mark and Ronan giving away tons of goodies. Yes, the were giving away CDs, shirts, snogs...(no, not really). All in all, VNV Nation have once again shown us that they are a band, who are making an impact on the music scene without following the "tried and tested" path. Some people thought that the venue was too small for VNV Nation, but the intimacy of the Garage upstairs certainly made it a damn impressive show. On a personal note, I think that VNV Nation could easily become the biggest thing since Nitzer Ebb, or even Front 242. In that case, they might have to go and tour the world something like every 6 months, and we would see them once a year at venues like the Astoria, or the Brixton Academy, paying 17.50 for it. This would be a real shame. VNV Nation's live performances live off the energy of their music, the claustrophobic venue and the interaction with the audience. And there aren't exactly three dozen of these bands out there.